After months of planning, training, and mental prep, our day finally arrived. 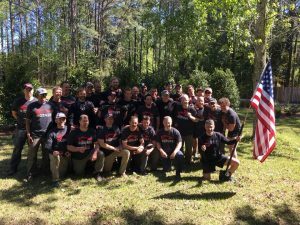 32 men showed up in Wilmington, NC to tackle the 5th F3 Custom Heavy. Our merry band included PAX from Raleigh, Carpex, Richmond, Carterico, ENC and Cape Fear. 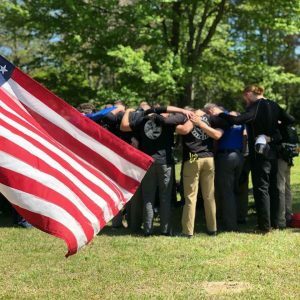 Among us we had 4 who had never completed a GoRuck event, and only 1 Heavy finisher (Bono). In the days leading up, many had that uneasy feeling of “What am I doing?”. YHC (Your Humble Correspondent) felt that anxiousness that comes from the uncertainty of what lies ahead. Largely, you never know what you’ll experience during these things. Especially a 24 hour event. That’s a lot of time to kill. You find yourself wondering, “Did I train hard enough?”, “Have I packed the right gear?”, etc. But at the end of the day, you just have to show up. And that’s what 32 PAX did. Cadre instructed YHC to have everyone lined up alphabetically before their arrival. We got in our ranks and did a quick name-o-rama to try and learn who everyone was. Cadre arrived, verified we were assembled correctly and began the admin phase. Things got real, and quickly. Get your weight over your head. Too slow. Hold it out in front. Over your head. Squat. Money and ID out. Too slow. Get your weight back up over your head. Money and ID out. Hold them up. Mask and snorkel on. Hurry up. Over and over. It felt like this went on for an hour. The mask and snorkel made breathing a challenge (a feeling we’d experience often). Eventually we moved to some PT. Heath called out 200 flutter kicks like it was nothing. We partnered up for our push-ups and sit-ups, one of the few expected aspects of the Heavy. 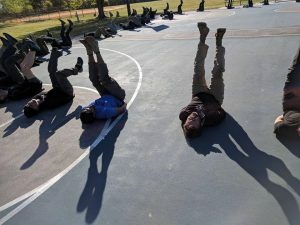 We were given 2 minutes to do max reps of each, as Cadre patrolled our ranks. Most of us hit the standard needed. Next up was the “Unknown distance, unknown time standard” ruck. Cadre Heath would set the pace from the front, everyone had to stay together. This was a team event, not individual. Spirits were pretty high, everyone was glad to not be holding their ruck plate up anymore. We took the time to get to know each other and try to remember names as we shuffled along behind Heath. His pace was impressive, but didn’t feel much faster than many of the timed 12 mile rucks we trained. When we made it back, Cadre let us know that we had covered just over 12 miles in 3 hours. Not bad. The sun was going down and we figured it was around 8pm. Cadre Heath would be leading us for the next portion of the event. He let us know we would be given an evolution, with distance and time hack. If we met our time hack and stayed together, we wouldn’t have to carry more than our team weight, flag, and extra jugs of water. We’d also get longer breaks. If we didn’t make the time hack, we would acquire casualties and have shorter breaks. Obviously, we were motivated. Our first evolution was to Hugh McRae Park. A Team Leader and Assistant Team Leader were assigned to get us there. We moved quick and hit our time hack with time to spare. After each evolution we would have a “Leadership Challenge”. Similarly to our movements, we were given a set of rules, and a time hack. Complete it, and there was reward. Don’t complete it, there’s a penalty. After each, we did an AAR (after action review) with our TLs and ATLs to go over successes and failures. YHC won’t give too much away on these. That’s part of the fun, the mystery. To sum it up, we moved through the night from point to point, hitting all of our time hacks. We conquered each of our Leadership Challenges as well, not without slip ups but success nonetheless. We were feeling good. The TLs and ATLs were leading us to victory every time. Confidence and morale were high. Along the way, we lost our first participant to what looked like some nasty nausea. Never what you want to see. We cherished each break that we received along the way, knowing not to take it for granted. Because we were so motivated to hit our time hacks, we frequently pushed the pace on our movements. Running with your ruck on is never fun, but it was better than carrying casualties that would slow us down. We probably made 5 movements and did 5 Leadership Challenges, and seemed to defeat each one. Things were going well. On our last movement with Heath to Wrightsville Beach Park, we lost Mr. Hand to a bad quad injury. Something he’s battled in the past. This was a psychological blow, especially to the guys who know Hand. He’s a freakin beast. Cadre Heath med-dropped him around 3:30am. YHC has no doubt he’ll be back to destroy the Heavy one day. We pushed hard and ended up making this time hack by 14 seconds. Whew. At WB Park, Cadre JC re-emerged. You could tell it was about to get real. 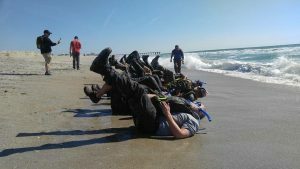 JC shared with us about the SERE Training (Survival, Evasion, Resistance, Escape) that he and other members of Special Forces have to go through. We were about to find out why we had to bring a dark colored bandana and zip ties. Shirts and shoes were taken off, handcuffs and blindfolds were put on. Check out the pictures on Facebook. 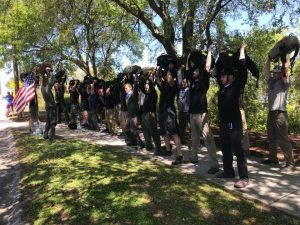 Following our captivity, we connected all of our rucks with locking carabiners into one giant “ruck log”. We had to get this thing to the beach. With a flag bearer, team weight carrier, and two team leaders, there were more rucks to carry than men. This sucked. We moved at a slow pace, figuring out slightly better techniques for carrying this thing as we went. At the beach, we got to enjoy the sunrise and take a quick group picture. Dawn was finally upon us, and it felt great. We headed back to the park. As we strolled into WB Park, we saw the men of F3 Cape Fear assembling for the Saturday morning workout”Baywatch”. The PAX gave us a warm welcome and we joined them for the workout. 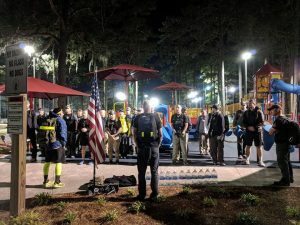 Following the workout, they provided us food, drink and even a sausage biscuit to enjoy (although Cadre encouraged us to hold off enjoying that). We were promptly informed, we’d also be doing the FiA workout, which follows the F3 workout. The workout included some great stretching, which was badly needed and even a few dance moves. Watching Pepe dance around was a highlight. Lots of smiles, still feeling good. Well not for long. Our next movement was back to the beach. Time to use those masks an snorkels. 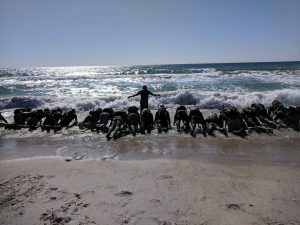 We low crawled into the surf, linked arms while it knocked us on our faces, push-ups, flutter kicks, heavy mouth breathing. We were soaked, sandy and exhausted. From there we were instructed to move to the track at Wrightsville Beach Elementary. One of the few other elements we knew was coming, was JC’s infamous PT Test. 100 burpees, mile run, 50 burpees, mile run, completed in 35 minutes. Everyone knew this was coming and trained it. Except for one thing. JC informed us that since we had gotten too spread out on our way over, we would be doing PT Test 2 with our rucks on. Talk about a gut punch. We had an hour to do it as a team. EPO called out the burpees like a freakin beast, and we finished with a few minutes to spare. Can’t say our form was the best, but everyone grinded it out. Our final movement was back to the start point, about 8 miles. The end was in sight, but still a long way off. Everyone was spent physically and emotionally. The sun was out, and our water supply was low. We took off. Unfortunately this wasn’t just a walk back to the start. We were moving at JC’s pace, which was not slow. We got too stretched out, so we were penalized by having to put our masks and snorkels on. We were given casualties. This was the lowest of the low. The masks and snorkels made it hard to breath while still moving at a ridiculous pace and carrying people. We struggled to create a cohesive plan for rotating on the casualties. Multiple times we stopped for PT, still wearing masks and snorkels. Pouring sweat and with little to no water left, our mental state was pushed to the max. This was YHC’s lowest point. With a screaming left calf muscle, and no water, every step was a battle with myself. Vector Victor and Pepe were our team leaders, and encouraged the PAX to talk to the guy next to you. They shouted encouragement and pushed everyone to keep moving. And we did. Barely. As we turned down the final street, we knew the end was within our reach. YHC mentally prepared for more PT before patching. If you prepare for the worst, anything less feels great. We lined up in formation and were told we owed burpees for remaining infractions. YHC was at the front of formation, and as we did burpees looked back to see Cadre walking through handing out patches. We did it. Patch ceremonies are always awesome, but this one was extra special for YHC. To see months of planning and organizing culminate in this moment was amazing. 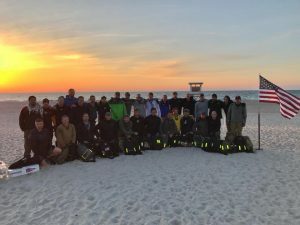 The Cadre shared kind words about our team, and the accomplishment of completing this event. YHC got to individually call up each man and hand them their t-shirt with a big hug. We took our team picture, and slowly moved to the beer and food graciously provided by Wreck it Ralph and the other Cape Fear PAX and families. 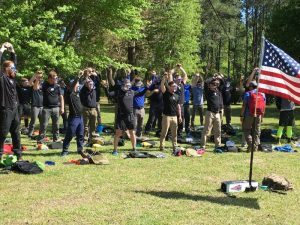 When YHC started F3 four years ago, the thought of just a GORUCK Tough seemed impossible. But as these things often go in F3, the challenge was met and conquered. Even after 4 Toughs, a Heavy seemed even more daunting. Yet that goal felt like it needed to be tackled. Without the encouragement and push of my F3 brothers, it would not have been possible. The stories, and hilarious moments are something YHC will remember for a very long time. But even more, the 29 men who received that red patch will share a bond that was created in the crucible of 24 hours suffered together. 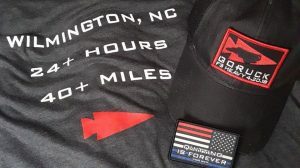 To those 29, the Cadre, and all of F3 Nation, thank you.